As Democratic Field Grows, Party Activists Ask: Where's Joe? Former Vice President Joe Biden speaks during the U.S. Conference of Mayors Annual Winter Meeting in Washington, Jan. 24, 2019. Former Colorado Governor John Hickenlooper and Washington state Governor Jay Inslee are the latest Democrats to jump into the crowded 2020 presidential field. But a lot of Democrats continue to wonder about the man who, so far, isn't there: former Vice President Joe Biden. The Democratic presidential field now stands at 12 candidates, with Biden and several others considering whether to enter the race in the coming weeks or months. Senator Sherrod Brown of Ohio and former Congressman Beto O'Rourke of Texas are among those pondering a presidential run in 2020, in addition to Biden. Other potential contenders have ruled themselves out, including former attorney general Eric Holder, former New York Mayor Michael Bloomberg, Senator Jeff Merkley of Oregon and the party's 2016 nominee, Hillary Clinton. Clinton told New York TV station News12 that even though she won't be a candidate next year, she intends to keep speaking out about "the kinds of things that are happening right now that are deeply troubling to me." Biden said last week he is "very close" to making a decision on a White House run and said there was a "consensus" within his family that they support him making a third presidential bid. He decided against challenging Clinton for the Democratic nomination in 2016 following the death of his 46-year-old son, Beau, from brain cancer. Biden ran in 1988, but dropped out during the campaign after allegations that he had plagiarized a speech from a British politician. He also ran in 2008, but quickly dropped out after making little headway in a year in which Barack Obama exploded onto the national scene. FILE - U.S. President Barack Obama, right, alongside Vice President Joe Biden, speaks in the Rose Garden of the White House in Washington, July 1, 2015. 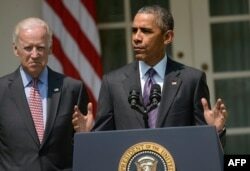 Obama then chose Biden to be his vice president, an eight-year tenure that seemed to cap a lengthy political career that began with him winning a Senate seat in Delaware in 1972. At the time, Biden was the sixth-youngest senator in American history, just shy of 30 years old. Biden will have the opposite problem if he runs for president in 2020. Currently 76, Biden would become the oldest person ever elected president, easily eclipsing the record set by Ronald Reagan. Reagan won a second term in 1984 at the age of 73. Biden does have some advantages. He leads in the polls and is the nearest thing to a Democratic front-runner in a field heavy on new faces and low name recognition. "Let's be honest. Early polling does not tell you a whole lot in these early races, but it is very encouraging to Joe Biden," said Jim Kessler of Third Way, a center-left advocacy group. "It shows that people like him and that there are very few Democrats who don't like him." But Biden would also have to confront a fear that he may be past his prime as a candidate and may not fit in with a Democratic Party that seems to be veering to the left and driven by younger voters. "Obviously there are challenges that Vice President Biden faces, including having run a couple of failed presidential campaigns," said Brookings Institution expert John Hudak. "But also having a record as a senator on criminal justice issues that are very far out of step with mainstream Democratic values today. And so, the 1994 version of Joe Biden may be the worst opponent for the 2020 version of Joe Biden." If he does get in the race, Biden would likely emphasize his experience in government as a counterpoint to President Donald Trump and his chaotic first two years in office. Biden would also point to his past ability to win over white working-class voters, many of whom propelled Trump to victory in 2016. In particular, Biden would target working-class voters in key states in the Upper Midwest, where many Democrats believe the 2020 election will be decided. 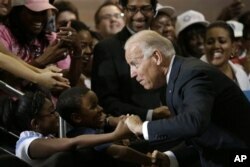 FILE - Vice President Joe Biden greets Lawrence Smith, 8, and Madison King, 9, both of Van Buren Township, Michigan, during a campaign stop at Renaissance High School in Detroit, Aug. 22, 2012. Trump narrowly won Pennsylvania, Michigan and Wisconsin with an overall combined popular vote total of roughly 71,000 votes, and that propelled him to victory in the Electoral College. Democrats had success in those three states in last year's congressional midterm elections, and they believe a repeat of the same voter turnout next year would put those states back in the blue Democratic column. But some analysts warn that Biden's extensive experience could work against him next year if Democrats crave a fresh face unencumbered with a long record of congressional votes in Washington. "My intuition is that there has been an overinvestment in what I call Washington figures," said Will Marshall of Progressive Policy Institute, a centrist Democratic think tank. "And there is really not a lot of benefit in being a state-of-the-art Washington senator." And despite Biden and Senator Bernie Sanders of Vermont leading in the polls, Biden's fortunes could change quickly once he decides to enter the race. 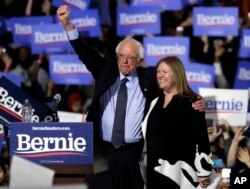 FILE - Sen. Bernie Sanders, I-Vt., and his wife, Jane O'Meara Sanders, greet supporters as they leave after his 2020 presidential campaign stop at Navy Pier in Chicago, March 3, 2019. "By no means are they really front-runners," said Hudak, of the Brookings Institution. "This is going to take quite a bit of time and quite a bit of organization, and voters will be looking to see really what these campaigns will be about." Biden would also likely be seen as a counterpoint to the leftward bent of the party contenders so far, with several endorsing a sweeping new government health care program known as "Medicare for All," and a groundbreaking environmental approach known as the "Green New Deal." Unlike some of the lesser-known Democratic contenders, Biden supporters say he can afford to wait longer to get in a race that so far is not coming into focus. "I don't think it is a problem to get in early. But I do think it is important that these candidates find a way to distinguish themselves from the others," noted John Fortier of the Bipartisan Policy Center. Whether Biden gets in the race or stays out, a long, hard-fought battle for the Democratic nomination is ahead, according to analyst William Galston at the Brookings Institution. "We are in for a period of about a year where there will be competition among Democrats of different hues and stripes," Galston told VOA recently. "And there is no smoke-filled room directing this process. It will play out live in full view of the American people."